As mentioned in the last update, our order for static grasses had turned up. Three shades of static grass were quickly applied where Wallerawang's yard tracks used to be, behind the Down station platform. The brownest colour was applied first, followed two differing greens, worked together with a random spread of density and colour. 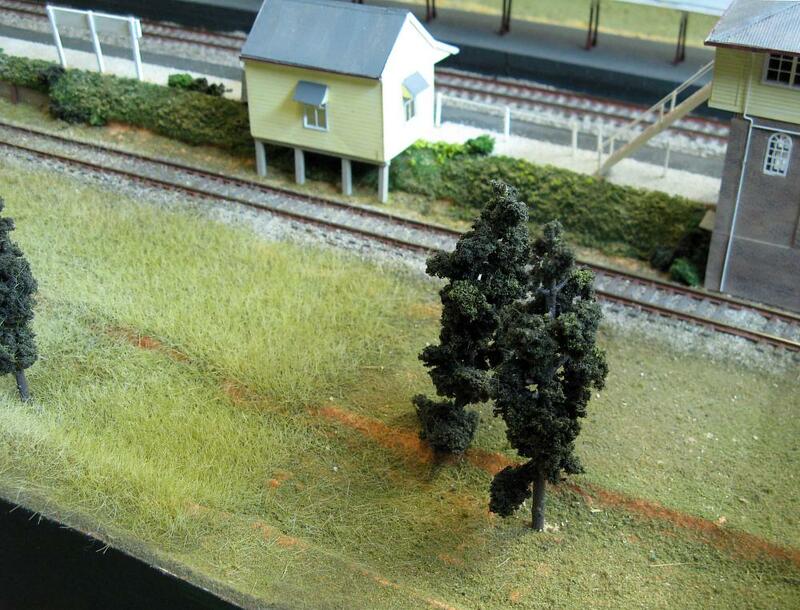 To the right is the original scenic material applied to the layout, and on the left the static grass added to date between the layout edge and the Down refuge. Some slight touch up work with an airbrush was required for one small area of the backdrop, so we used the opportunity to add some clouds to the sky. A greyish colour was mixed and sprayed to represent the underside of the clouds, with thin washes of white to fluff them out. Clouds were added to the two front modules, with more to be applied to the end modules when they are removed from the trailer for work. As the backdrop image was now finished, we could move onto adding more detail to the layout. Between Wallerawang station and the shops along the main street are a couple of picnic tables, one of which was used for our lunch during a site visit. After finding a suitable example to copy, a pair of tables were contstructed out of styrene, given a quick paint, and glued to another piece of styrene, painted to represent a concrete slab. 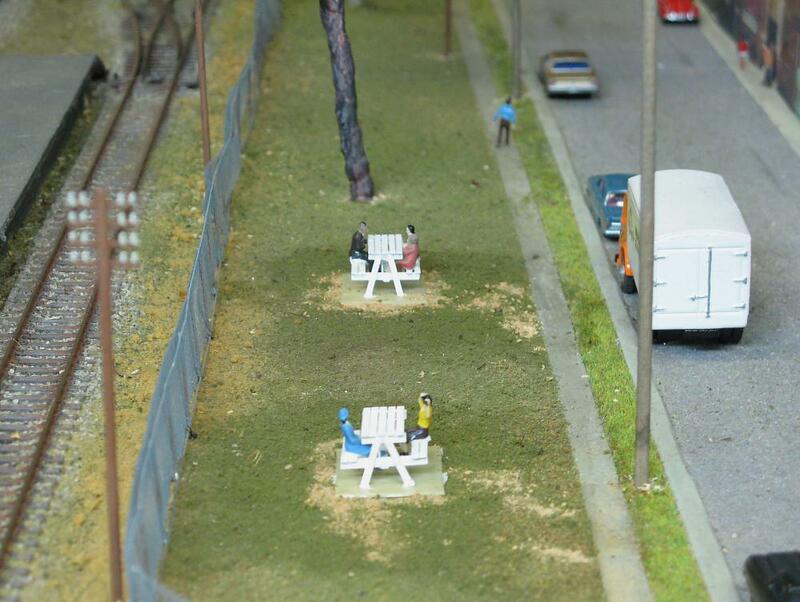 The benches were populated with some pre-painted people, picked up on special at the last exhibition. The two picnic tables between the dock road and the take away across Wallerawang's main street. Some of the detailing items that now can be glued into position are all the cars and trucks that we had been placing at every exhibition. Before they end up in their final places, the cars that are in traffic (ie: not parked) would have at least drivers added to increase realism. Thankfully most of the scale vehicles can easily be taken apart, and while apart they were converted to right-hand drive and had their interiors painted where necessary. 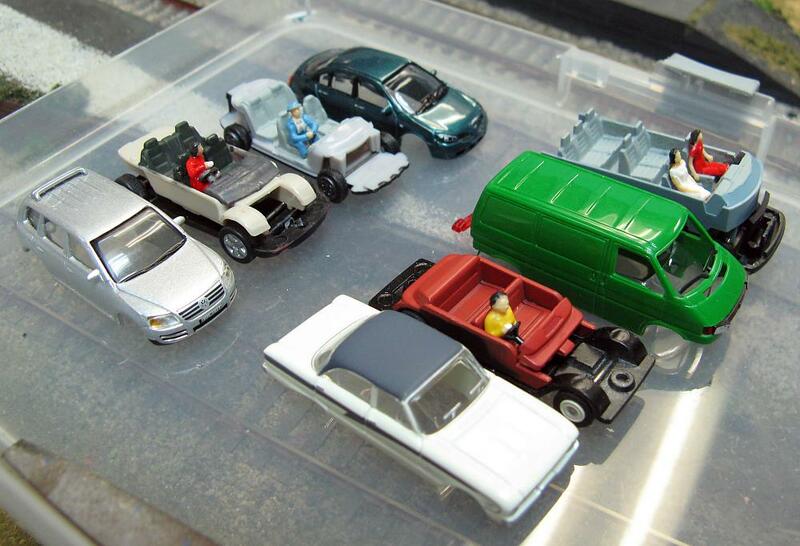 Four model vehicles taken apart with drivers and passenger added. Some of the scale figures were amputated to fit in the space provided. Work has also continued on the signalling system, with a test board completed and a very rudimentary signal constructed in order to test the circuit and the operation of the servos. The initial results were very positive, with the software edited to eliminate any servo "jitter" making the semaphore arms twitch, as well as to slow down the rate of speed at which the arms travel. During this time the order of signal detail items in brass and white metal had been delivered from the UK, and with some hollow brass rod, work commenced on scratchbuilding the first upper quadrant signal for Wallerawang.